Grammy-award winning rapper and outspoken Christian Lecrae said on Thursday that Americans speaking on someone else's culture without understanding or attempting to learn about their perspective frustrates him. "America is full of different cultures, yet it baffles me when the people with cultural differences, who rarely interact with each other on deep levels, have so much commentary on the others cultural perspective," said Lecrae on Facebook. "I don't have any Moroccan friends and I couldn't imagine trying to understand their cultural outlook on the world without having meaningful relationships with them," the rapper added. Lecrae said he spent months traveling to Native American reservations and learned a lot about their culture after making friends with some of them and hearing about their experiences. By building meaningful relationships with these Native Americans, he was able to understand their perspective. 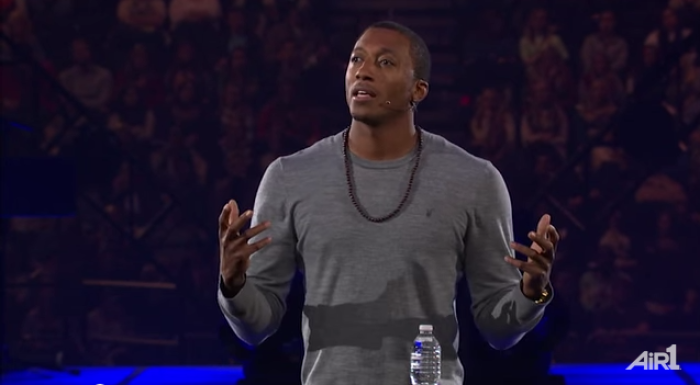 "Everyone who lives in America (or is Christian for that matter) does not see everything the same," Lecrae continued. "But if you find yourself upset at someone's outlook … that may need to be the very person you build a relationship. But what do I know? I'm just a rapper." During the past few years, Lecrae has used his writing skills in both music and media to address race relations in the U.S. from a Christian perspective. Last month, he penned an op-ed for Billboard.com where he discussed the June shooting at Emanuel AME Church in Charleston, South Carolina, where nine black people were killed by lone gunmen Dylann Roof. While Lecrae acknowledged that the families of the victims forgave the shooter publicly, he warned the church to be more pro-active in addressing the deeper racial tensions which led to the incident. "Let's not simply encourage the oppressed to be calm and act peacefully," he said. "Let us in the words of Isaiah 1:17, 'Learn to do good; seek justice, correct oppression." He also highlighted the spiritual battle raging within all mankind. "There is a great antagonist, and it does not have black or white skin," he continued. "It is the brokenness of humanity. May a love that miraculously mends our brokenness be the protagonist." During the Ferguson, Missouri, riots that were sparked by the death of Michael Brown, who was shot and killed by police officer Darren Wilson after Brown committed a strong-arm robbery, Lecrae spoke out against Christians who had no compassion for the black community. "Regardless of your view on #Ferguson. If [you] have zero compassion for that community you are not loving your neighbor as yourself. These are my cousins, aunts, nieces, uncles, nephews, and our ethnic bond is strong," Lecrae wrote on Instagram in August 2014. "It does not supersede my bond of faith but at times it feels like my eternal family could care less about my earthly family." He added, "I feel I'm only accepted if I perform well and don't act like my 'cousins.' I am the same as them but the grace of God has granted me opportunities they didn't get." He also commented on the officers who were working to control the rioters who were burning down family-owned businesses and residents' cars. "I pray for the families of the officers who haven't seen their wives and kids for days. I have no ill will toward anyone I only want unity, equality, and love. Were it not for the compassion of people who didn't look like me loving me I wouldn't be all that I am today."